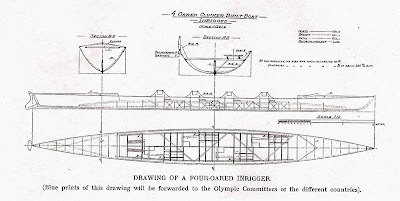 Following the recent item on inrigged coxed fours, on 27 November, some people may have the impression that inrigged rowing for pleasure and competition no longer exists. This is far from the case. 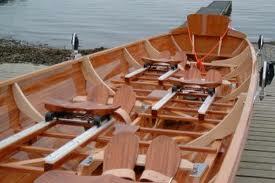 In Britain, the Skiff Rowing Association, SRA, has existed since 1901 and is still going strong. 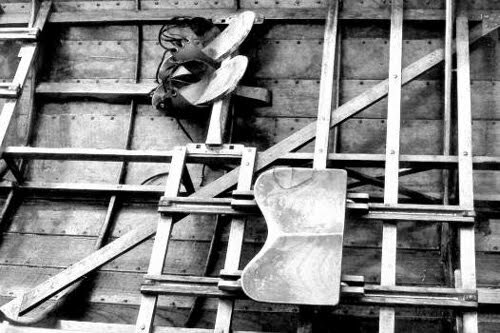 The Thames Skiff is a round bottomed, fixed seat, clinker built boat with the blades held in place by wooden thole pins at the side of the craft. Singles and doubles are the most common though there is no reason why trebles and fours cannot be made. The SRA sets the rules of racing and runs three events - the Inter-Club competition held at Henley on Thames and the Singles and Doubles Marathons. All other events are organised by affiliated clubs or regattas. Sunbury Amateur Regatta This has skiffing, punting, and dongolas (a punt paddled by a team of six people kneeling). It offers club and ‘local’ events and includes pub teams and a tug of war! It all ends with fireworks. Its website says: Away from river, the lawn provides a wide range of activities. From beer tents to Punch and Judy shows, there is something for every member of the family. Many community groups and charities have stalls on the lawn and Sunbury Regatta is a fundraising opportunity for many. Chertsey Regatta was established in 1851 and so is one of the oldest rowing events still in existence. It offers punting and skiffing. Hampton Court and Dittons Regatta started in 1881 as an ‘Aquatic Sport and Venetian Fete’. It has punting, skiffing, dongola and junior dingy races. Some early 20th Century film of the event is shown below (click on the black box!). 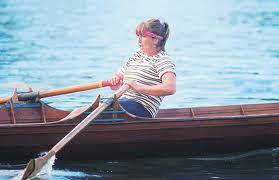 The Wraysbury and Old Windsor Regatta and The Walton Reach Regatta are so traditional that they do not have websites! Every year the Auriol Kensington Veterans’ Row to Henley passes through this delightful event (in a literal sense as we row over the race course in preference to going up the narrow temporary navigation channel) and I can vouch for the fact that Egham has a marvellous family atmosphere and is well supported by the local community. A glance at the web-sites of these clubs and regattas quickly shows that they seem to have a good balance of fun and competition, something which is sometimes lost in normal 'outrigged' rowing clubs with their ergo tests and six day a week training. (On finishing this article it suddenly struck me that an item on active inrigged rowing in Britain should include the thriving Cornish Pilot Gig racing scene. However, I will be returning to my native Cornwall for Christmas so I will produce something in the new year – hopefully after some first hand research). Thank you, Tim, for keeping the HTBS readers updated! Here is an article about the book, and here another. On 10 November I asked if anyone knew about a fiction story on rowing by Hylton Cleaver, who was a sport journalist and author of books for young boys. I know of several novels by Cleaver in which he tells the stories of boys boxing and playing cricket and Rugby football, but rowing, sadly not. 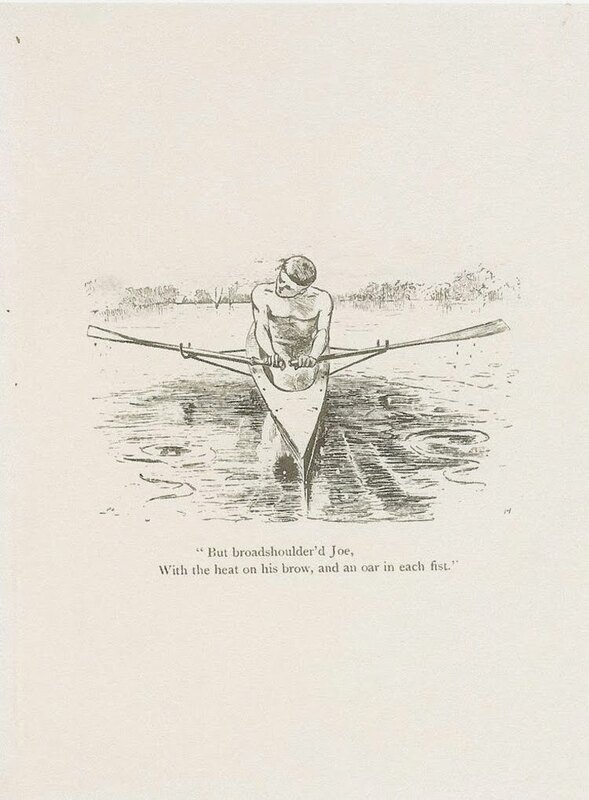 On 13 November Tim Koch published a nice piece about Cleaver, which had a link to many of the titles of his novels, but nothing stood out as being about rowing. 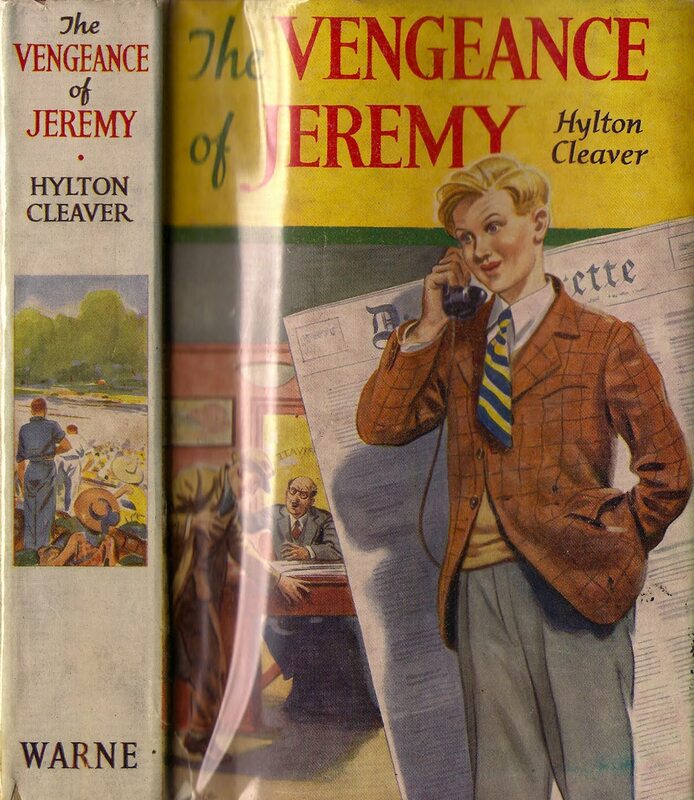 Then slightly more than a week ago, Tim sent me a link to a book by Cleaver on eBay, The Vengeance of Jeremy (1953). The cover was ripped, but on the spine one could see a 'rowing scene'. I looked around on the web and found a copy with a nice dust-jacket, and ordered it right away. The book arrived just before Thanksgiving, and I am happy to report that here it is, a fictional story by Hylton Cleaver that actually involved rowing, and rowing at Henley Royal Regatta, I might add. However, Cleaver does not miss the opportunity to mention also the Oxford-Cambridge Boat Race, Head of the River, and the Doggett's Coat and Badge Race. To be really honest, to a reader of today the story-line might seem a little weak, but to a young English boy, who read it now almost sixty years ago, he would probably indulge it with delight. On top is the cover and the spine, and on the right is the frontispiece. Please contact me if you know of any other titles of fictional works by Hylton Cleaver that involves rowing. Number of boards on either side: 7. A bar, about 1 metre in length, placed on its edge and supplied with two vertical, movable arms, 12 1/2 centimetres high, one at each end. In the middle of the bar a notch large enough to fit over the keel of the boat. 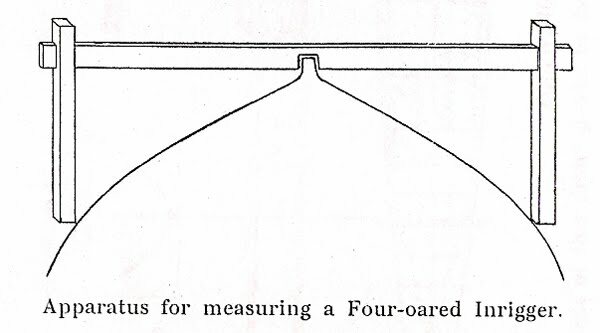 When a boat is to be measured, it shall be laid bottom upwards, with the apparatus placed over the middle rib. The vertical arm is then pushed so far along the bar as to touch the sides of the boat, at the water line. 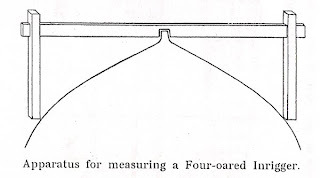 The distance is measured on the bar between the vertical arms, and if, for example, this distance for a four-oared boat is at least 0.78 metre, the boat holds the measurement; if the distance is less, it is not up to the standard. The length shall be measured in a straight line between the extreme ends of the stem and the stern. The depth shall be measured inwards, from the deepest point of the keel to the deepest part of the boat and perpendicularly up to a line through the upper edges of the uppermost boards. The width shall be measured between the outer edges of the uppermost boards on the widest part of the boat. The width at the water line shall be measured outwards on the middle rib and a height of 12 1/2 centimetres above the lowest board. At the Olympic rowing event in Stockholm the following inrigger crews competed: Nykjøbings paa Falster Roklub, Denmark; Société Nautique de Bayonne, France; Christiania Roklub, Norway; Ormsund Roklub, Norway; Göteborgs Roddförening, Sweden; Roddklubben af 1912, Sweden. The Danish boat won followed by the Swedish, Roddklubben af 1912 (seen below). See also HTBS 21 April, 2009. 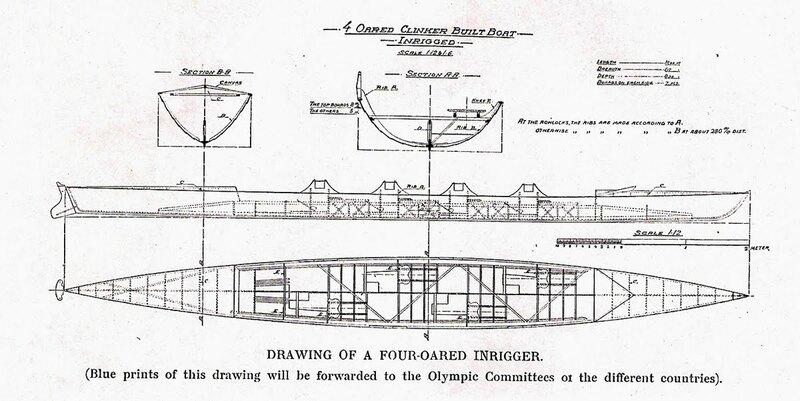 The inrigger would never again appear at an Olympic rowing event, and has to be regarded as an Olympic curiosity. This boat type has also started to fade away in the Nordic countries, which is really a pity! * A photo copy of the Rowing Programme, Rules and General Regulations was sent to me by Tim Koch. His club, Auriol Kensington RC in London, has a copy of this rare publication in their archives. It once belonged to the club's prominent sculler, Wally Kinnear, who took an Olympic gold in the single scull in Stockholm. ** My thanks to Michael Grace for allowing me to publish this piece. For more about the Olympic rowing in Stockholm, see my article Samuel F. Gordon and the 1912 Olympic Rowing. 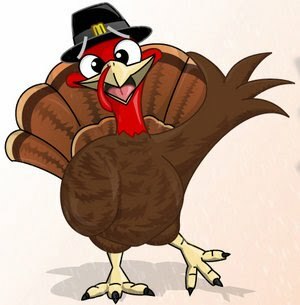 Today HTBS will take a break to celebrate the holiday. Martin Gough, who is assistant editor of the BBC Sport website, writes here exclusively for HTBS about the memorial service on last Saturday for Olympian Andy Holmes, who died on 24 October from what is believed to be Weil’s disease. In August 2008, Hammersmith and Fulham Council invited representatives of local sports clubs to drinks at the Town Hall to celebrate the achievements of local athletes at the Beijing Olympics. Two Olympic rowers brought their new bronze medals, a fencer who hopes to compete at London 2012 was introduced to the audience, as was a member of the Sydney 2000 gold-medal rowing eight, resplendent in his Great Britain blazer. The coach of Furnivall Sculling Club was part of the crowd, lurking in a corner, wearing a lounge suit, chatting to friends. Andy Holmes – the most decorated Olympian in the room, with two gold medals and a bronze too – wouldn’t have minded not being introduced, and probably didn’t expect to be. However, as his former pairs’ partner Sir Steve Redgrave pointed out during a recent BBC television tribute, Holmes was one of those responsible for the situation British rowing finds itself in today: one of the country’s most successful - and consequently best funded - Olympic sports. Cross was speaking at a memorial for Holmes, who died last month aged 51, at his alma mater, Latymer Upper School in Hammersmith. The school’s main hall was packed and the atmosphere celebratory for the life of a man whose energy enthused others, but occasionally cracked with emotion, with his absence keenly felt. 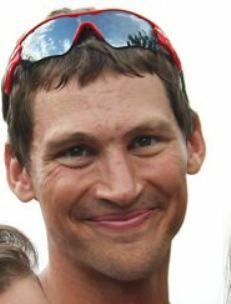 Family members, including his mother and two brothers, spoke of his love of fun, and habit of getting into scrapes. Holmes’ first wife, Pam, read a poem about their 20 years together – from their first meeting at a disco, being chauffeured around in his black Cadillac, the birth of their four children and his “mid-life crisis”, when they split up in 1999. Members of the Latymer 1st VIII of 1978, the junior national champions whose recent reunion, with Holmes back in the five seat, saw a group of 50-year-olds beat their current counterparts – one of the strongest school crews in the country – recalled his inspiring influence on their group on the water, and his anarchic side of it. Those present had no doubt that it was Holmes, rather than actor Hugh Grant, who was the more prestigious graduate of their school in 1978. Cross spoke of the ruthless drive and dedication that saw Holmes – in the days before central funding and plentiful sponsorship – work on a building site, carrying huge hods of bricks to improve his endurance, in the hours between his morning and evening training sessions. Richard Phelps, himself a Latymer old boy who made the Great Britain squad, spoke of his awe and fear when Holmes asked to join him in a pair on training camp. “Andy was the hard man of British rowing. He did not sit behind Steve Redgrave, he drove Steve Redgrave,” he said. Now a teacher, journalist and TV commentator, Cross also read the transcript of an interview he held with Holmes about his “lost years” – the period between leaving rowing in 1989 and resurfacing, thanks to the entreaties of a school friend, as a coach three years ago. Holmes was setting up a removals business in south London but threw himself into his second passion, drumming, with the same dedication he had once put into rowing – two hours in the morning on the legs, an hour in the afternoon on the fingers. Holmes was no friend of authority. A job as ambassador with the French Rowing Federation ended shortly after he undermined coaches by giving an unregarded duo a training programme that saw them beat the rest of the squad. He refused to brag about his Olympic success. A cousin was disappointed when Holmes forgot to bring his gold medal to a dinner he had organised, but both were pleasantly surprised when the oarsman discovered the medal in his suit pocket. When Holmes retired, the trophies and medals were consigned to a suitcase in the attic, and daughter Amy only found out about her father’s past life when she saw him featured in a book at school. The family, including Holmes’ second wife Gabrielle, have attempted to record many of the tributes that have been received over the last weeks, in part to show to his daughter Parker, who was four weeks old when her father died. Many, many thanks to Martin Gough for his nice contribution! 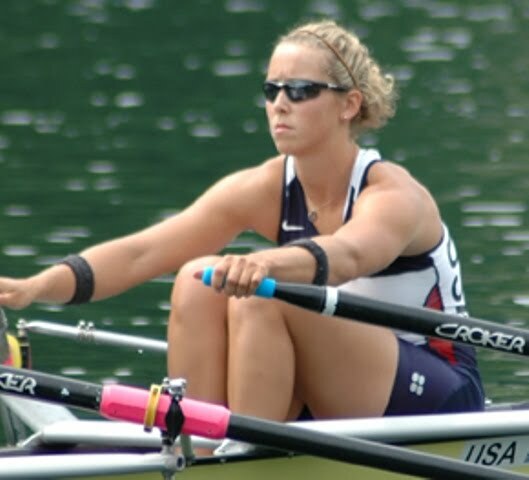 On 18 November, USRowing announced the names of 2010 Annual Award Winners. I was happy to see that this year's recipient of USRowing's highest honour, the USRowing Medal is Frank Cunningham, legendary coach out in Seattle. 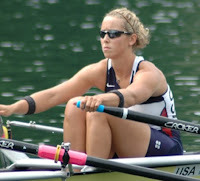 Cunningham began to row at Noble and Greenough School in Massachusetts in 1937. 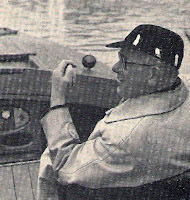 During the 1940s he rowed in different crews at Harvard University. He has coached many of the U.S.'s most prominent scullers. Read USRowing's press release here. Another item on eBay that Tim Koch brings up in his e-mail from the other day is two 16mm films from the 1950s/1960s of 'London University Rowing Club' (sic), with sample clips posted on YouTube. Tim writes, "I do not think any of these rowers were good enough to be part of the University of London Boat Club and get a 'Purple' but they may have been members of a boat club of a college of the University of London." Click here to get more information about these two films on eBay. Below is one of the sample clips. Pull! You Are Not Doing This For Fun, Are You? The latest issue of Rowing News, December 2010, arrived on Saturday. I must confess I have mixed feelings about this magazine. Although all articles are very well-written and the photographs almost all the time are incredible, the coverage is single minded. You can read about the top-notch rowers - ‘the best of the best’ -, or how to train to be one in that group, and which regattas they won. Articles are telling you how to eat and drink right, to train on the erg to hit the high scores (as a matter of fact, in the December issue there were several articles dealing with rowing machine work-outs), how to do the right winter training to please your coach, etc. If you are a pleasure rower who is doing this sport for fun, as a recreational activity, rarely will you find an article in Rowing News helping you with your little endevour. But maybe the magazine knows that those women and men are not subscribing to their magazine anyway? Being the best (coming second never counts), I guess, this is the mind set of doing sports in the U.S., and for rowing, the way the governing body in this country, US Rowing, has its focus. Why, for example, has USRowing not launched a campaign like British Rowing’s successful Explore Rowing? Here you can find where can you learn how to row and scull, which waterway routes you and your friends should take to see the scenic views, which clubs will lend you boats, etc. The competitive tradition in the U.S. is very strong; if you are doing it anyway, why not do it for winning gold by pushing yourself to the extreme limit? Or so the way of thinking goes it seems. I am not saying that I did not enjoy Rowing News December issue, I actually did. Peter Van Allen’s article “The Right Fit” tells me a way to get my children to the right colleges so they can row, on any level. Topher Bordeau has a very unscientific article about why hard-pulling rowers produce more female offspring (they do?). Of course, Andy Anderson, a.k.a Doctor Rowing (seen on the left), has yet to write an uninteresting, boring piece. In this issue he straightens out the question what kind of rowers are sitting in the eight’s different positions, starting with the Stroke and down to Bow. Good Tim Koch sent me an e-mail earlier today pointing towards some interesting rowing stuff on eBay. Up for sale is the five-person sculling boat - a quintuple - built by Carl Douglas Racing Shells for the band Take That’s “The Flood”, which has become a smashing hit. You might already have watched the DVD here on HTBS (if not, click here). The shell, with the name ‘Progress’, was specially created by Carl Douglas for this DVD, which marks Robbie William’s return to Take That. When I am writing this there is six more days to go before the auction ends. Right now the bid is £1,500.00 (reserve not met). Hurry up to put a bid in for this unique boat. If you would win, a part of the money will support “youth and grass root rowing” in England. Read more about it on eBay’s site. Good luck with your bid! A memorial service for Andy Holmes took place at his old school, Latymer Upper, yesterday, on Saturday 20 November. His Olympic partner, Sir Steve Redgrave, describes their true relationship to Christopher Dodd, who is writing this exclusively for HTBS. 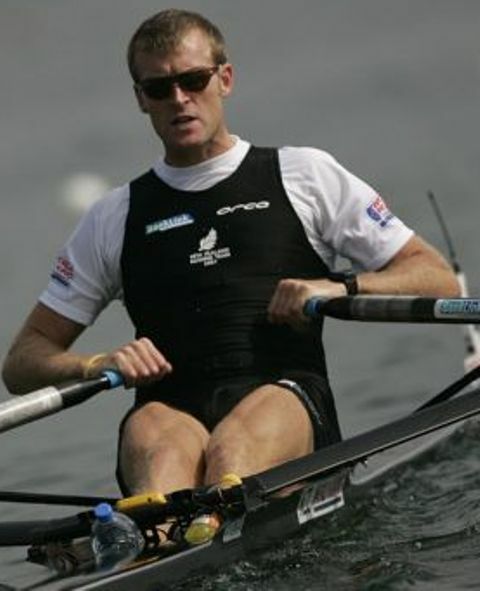 The sudden death of Andy Holmes on 24 October sent shock waves round the rowing world, not least at Karapiro in New Zealand where the world championships were in full swing. Holmes was Sir Steve Redgrave’s first Olympic partner and he played a pivotal role in the revival of Britain’s international rowing fortunes in the 1980s. 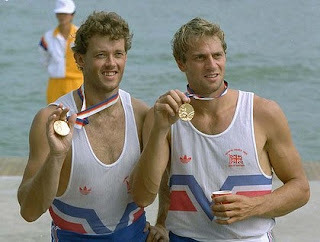 Holmes and Redgrave raced with Martin Cross and Richard Budgett in the coxed four that put British rowing back on the Olympic gold standard at LA in 1984. In 1986 Holmes and Redgrave won two Commonwealth golds and the world title in coxed pairs, and in 1988 they went on to win gold and bronze respectively in the coxless and coxed pairs at the Seoul Olympics. Before they arrived in Korea, however, their relationship had been branded as a failed marriage, and this reputation passed into lore. In 1989 Redgrave was determined to continue, but Holmes had had enough. In May, just as the four he was rowing in won a medal in Duisburg, he abruptly turned away from the sport. Since then his self-imposed smoke screen has obscured his contribution, until he re-emerged three years ago as coach to Furnivall Sculling Club in Hammersmith and Langley Academy in Slough. 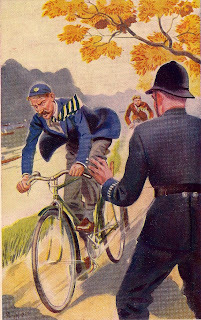 Redgrave blames a national newspaper for starting the hare of the pair’s bad personal relations, a chase swallowed whole without question by much of the media. The real tragedy, Redgrave said as he was preparing to commentate on the strongest British rowing team ever fielded, with finalists in every Olympic boat class, is that Andy will never know the esteem in which he was held. See also Getting to Know Andy Holmes in RowingVoice 4:6c. My warm thanks to Chris for his very interesting contribution! 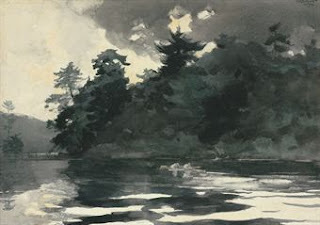 This ‘new’ Homer rowing picture is called Two Men Rowing on a Lake, a watercolour from 1892. It was for sale at Christie’s, click here to read more about it. 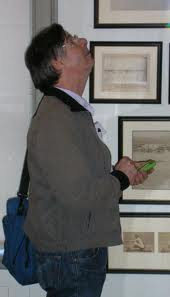 Bill thinks the poem, see below, is from a local race in England, probably County Dorset, as that is the place where William Barnes (1801-1886) lived and wrote. This is, indeed, very interesting, as the ‘rowing images’ by Homer that I was aware of were of fishermen rowing in their workboats, not any sport sketches of men racing. Great ‘find’, Bill, and thank you for sharing it with HTBS readers. 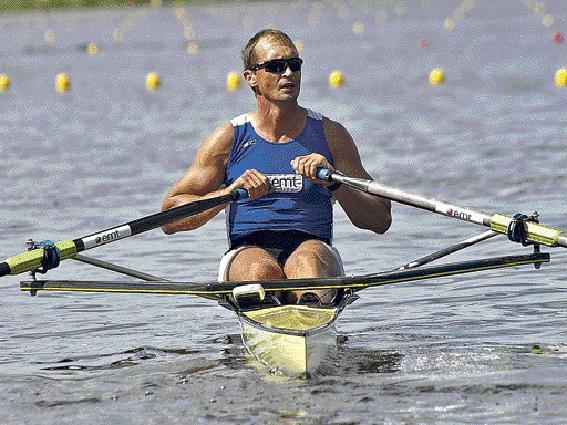 Estonian Public Broadcasting Company ERR is reporting today that the legendary Estonian sculler Jüri Jaanson, 45-years old, is retiring. Jaanson has surprised the rowing world several times by, at an 'old' age, taking medals at Olympic Games and FISA World Cup events. Click here to go to Jaanson's FISA biography with a total list of his positions and medals. Swedish Rowing Magazine Turning 20 Years! My good friend Per Ekström, editor of the Swedish rowing magazine Svensk Rodd, is very busy these days. He is working hard on getting the last issue of the year out to the readers. I am guessing he had to shuffle some pages around after Frida Svensson became World Champion in the single scull in New Zealand a week ago. Svensson's victory is an enormous success not only for her, but also for Swedish rowing. Despite the many rivers, lakes, and the long coastline, rowing is not a big sport in Sweden. However, Ekström's magazine is reaching almost 7,000 members of the Swedish rowing clubs, and they get the magazine for free. 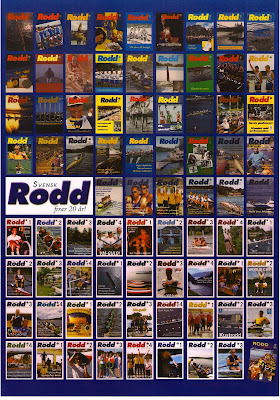 This year Svensk Rodd is celebrating 20 years. I have already told the story how Ekström and I started the magazine in 1990 in an entry on 19 March 2009. It seems Ekström has no intention to hand over the helm to someone else, which is good because few know more about rowing than he does. He has proven great editorial skills these two decades. Congratulations to Svensk Rodd and Per, a jolly nice fellow and a good sport! Hylton Cleaver was a lifelong author of boys’ adventure stories (especially the peculiarly British ‘boarding school tales’) and a well-known sporting journalist covering rowing, boxing, Rugby football and equestrianism. 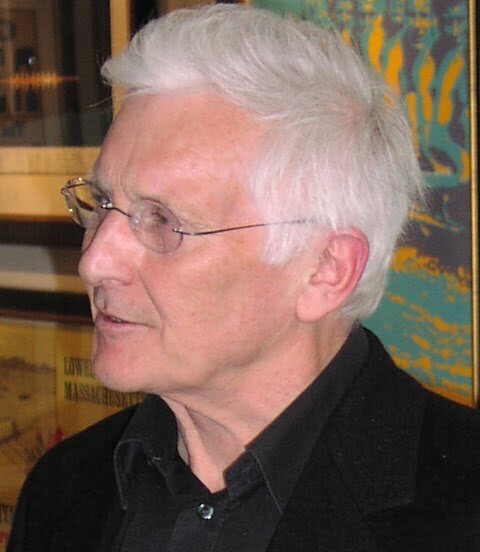 He also wrote crime fiction and factual books on show jumping and A History of Rowing (1957). My view of the latter book is that it reflects the English amateur rowing establishment of the time. He acknowledged that rowing existed outside of the big London clubs and the ancient universities and private schools but it seems that he did not feel that a book entitled ‘a history of rowing’ should cover this aspect of the sport in any detail. True, there was some coverage of professional rowing, the Doggett’s and the working man’s National Amateur Rowing Association but, at least by modern standards, this does not excuse the excessive concentration on the Gentlemen Amateurs of the ‘Putney Mafia’. [Following the First World War] much of his work appeared in ‘The Captain’ where another young author, Mr P.G. Wodehouse, was already making a name for himself as a writer of school stories. Indeed, Cleaver’s stories were not dissimilar from Mr. Wodehouse’s, but many contemporary judges regard them as superior. 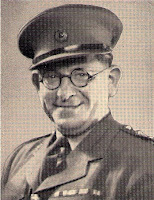 Many of Hylton Cleaver’s stories were set in the fictitious ‘Harley School’. He wrote ‘The Harley First XV’ (1920) and ‘The Harley First XI (1922) covering Rugby football and cricket respectively – but no ‘Harley First VIII’ as far as I can discover! For more about his books, please click here. An enviable talent, even rarer now than when this was written. Many warm thanks to Tim for his insightfully thoughts on Hylton Cleaver! On Thursday Armistice Day was celebrated in Great Britain (in the USA it is called Veterans Day) and yesterday The Guardian published a short article about a music piece played on BBC radio 3. The newspaper writes that it was "wholly right for Armistice Day", Elegy for String Orchestra by Frederick Septimus Kelly. In the rowing history world the composer is more known as F.S. 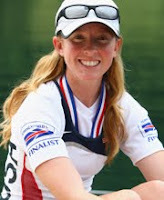 Kelly, famous Henley winner and Olympic rowing champion. To read the article in The Guardian, click here. To read two earlier pieces about F.S. Kelly on HTBS (9 September 2009), please click here. 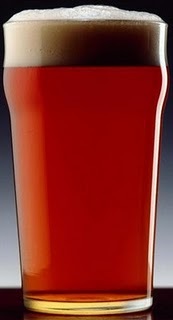 The Philadelphia Challenge Cup, also known as the Gold Cup, mysteriously disappeared in the beginning of the 1960s. Read more about the mystery here. Later on, the Cup was actually found in an antique store in Philadelphia in July 1996. The owner of the store had obtained it at an estate sale. Schuylkill Navy's claim to get it back from the store led to nothing. In an e-mail to me sent earlier today, Mr. John Hogan of The Mariner Insurance Group in Philadelphia confirms that the Cup has been purchased by Herb Lotman. 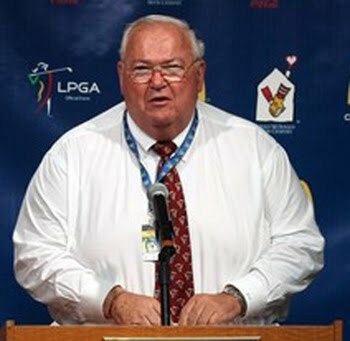 It is not known how much Mr. Lotman paid for the trophy, but in his little cryptic e-mail Mr. Hogan says that it is Mr. Lotman's intention to "re-institute the challenge race at Dad Vail, and a women's race, too." The Philadelpia Challenge Cup is 18 inches tall and solid gold and estimated to a value of $10,000-$20,000 according to a web site. Besides Jack Kelly Sr., (Vesper BC), other winners of the Cup are: W.E. 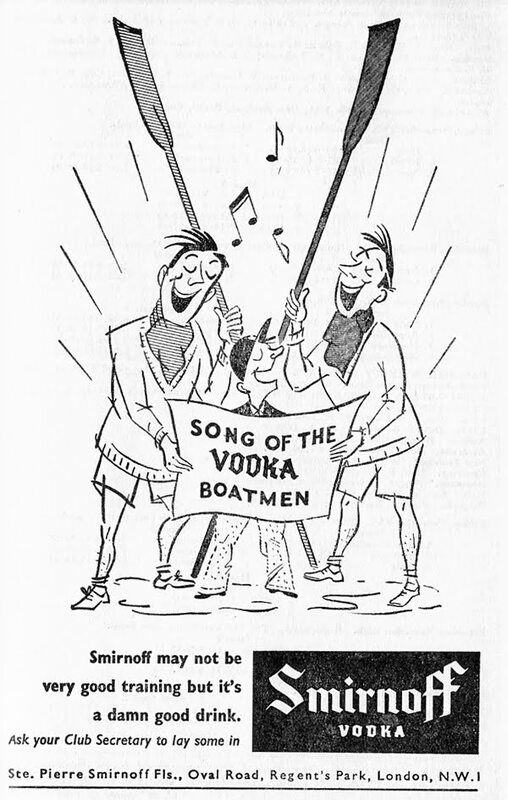 Garrett Gilmore (Bachelors Barge Club), Paul V. Costello (Vesper BC), Jack Beresford Jr., (Thames RC, Great Britain), H.R. Pearce (Australia), Charles Campbell (Winnipeg BC, Canada), Gustav Schafer (Germany), Joseph W. Burk (Penn A.C.), Mervyn T. Wood (Australia), Vladimir Ivanov (USSR), and Don Spero (USA). It seems a major sport event in New Zealand last weekend had a problem with spectators consuming too much alcohol. These drunken spectators abused other spectators and threw full and empty beer bottle at others in the crowd. Am I talking about the spectators at the World Rowing Championships on Lake Karapiro? No, of course not! Although, it was written that “Almost 70,000 spectators attended the week of competition [at Lake Karapiro]. They drank copious quantities of beer in the hot sun and they roared and stamped and banged their seats in an effort to cheer the Kiwi crews home.” However, the writer goes on saying “they did not throw missiles, abuse the opposition or brawl in the stands.” Instead, this was something that happened on Saturday 6 November when there were two matches at Eden Park, which is New Zealand’s largest stadium, Papa New Guinea v. England Rugby League, and New Zealand v. Australia Rugby League. It seems to have been so bad at Eden Park that some sport journalists in the New Zealand media now would like to ban alcohol from all major sport events in the country. Read two articles about this here and here. See also 'Cheers, Rowers', HTBS 23 September 2010. Is There Any Fictional Rowing Story By Hylton Cleaver Out There? Some weeks ago I ordered a book from a bookseller in Scotland, The Great Book of School Stories for Boys (1933). According to the web site where I found the book, it contained stories by Hylton Cleaver, Captain G.A. Hope, N. Humphrey, Davy John Sweet, etc. 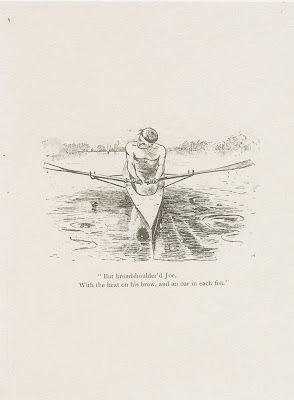 The web site also had a picture of the book cover, an image of some rowers and with 'Pull!' written on the left-hand corner. Anyone interested in rowing history would immediately recognise Hylton Cleaver's name as he was a great authority on the sport several decades ago. His most famous book about rowing is A History of Rowing, which was published in 1957. This is an entertaining book with a lot of good stories and anecdotes about The Boat Race, Henley Royal Regatta, the European Championships, Olympic rowing, The Doggett's Coat and Badge Race, the professionals, 'sea rowing' (which today is known as 'coastal rowing'). etc. For one of Cleaver's good stories, about Ran Laurie and Jack Wilson, see HTBS 1 June 2009. 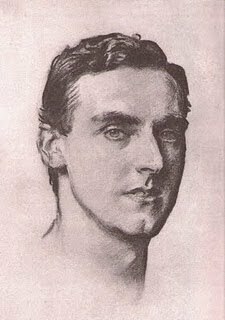 What is maybe not that much known by rowers and rowing historians today is that Hylton Cleaver began his writing career, not as a sport journalist, but as a short-story writer, novelist and playwright. 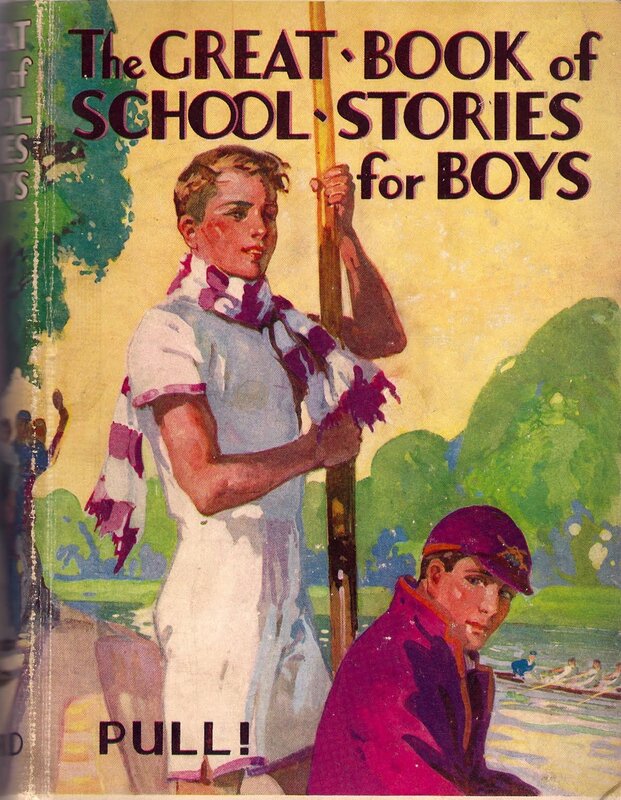 As Cleaver wrote tons of stories for boys, I thought, or hoped, that the rowing image on the cover of The Great Book of School Stories for Boys would be related to a rowing story by Hylton Cleaver, maybe with the title 'Pull!'? Not so! When the book arrived on my doorstep, I could see that there is no fictional rowing story by Cleaver in this book, nor is there a rowing story at all... Of course, I should have checked with the bookseller before I ordered the book, but the book was very cheap, and the cover is still very nice, I think. But let me ask you, dear reader, do you know of any fictional rowing story by Hylton Cleaver? If you do, please contact me! Dan Boyne of Harvard University continues here his story, published on Row2k, how he helped the film crew of The Social Network to find suitable locations for the rowing scenes. Part 9.This is the last part of Boyne's great tale about shooting the rowing scenes for this movie. Hélène Rémond has updated her entry from yesterday, Sunday 7 November, about 'Rowers On Twitter'. You will find more rowers and links. By the way, many of the rowers are now World Champions! I cannot really let go of the World Championships, or maybe more correctly, New Zealand. This great rowing nation had a significant impact on my rowing club in the beginning of the 1970s. This is how the story goes: In the end of the 1960s, there was no activity at my rowing club in Sweden, Malmö Roddklubb. The club did not have a functioning committee, hardly any rowers, and everything seemed to go rapidly down the pipes. Malmö Roddklubb was founded in the late 1883 in the city of Malmö, in the south of Sweden (although, officially the rowing activities began 1 January 1884). In 1905, one of its members created a flag, with two white and two blue fields, that was used at all kinds of different club events. The flag was also on the oarsmen's clothes when they were racing, which happened frequently. But then in the end of the 1960s, the club was dying. This came to the attention of some old rowers who had rowed for the club in the 1950s. They decided to save the club and restart the activities again, which happened around 1971. 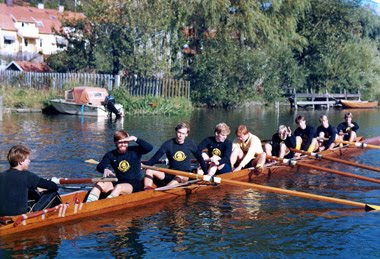 At the 1972 Olympic rowing events in Munich, New Zealand very surprisingly took the gold in the eights (all the other gold medals in rowing went to East Germany and the Soviet Union). The committee of Malmö Roddklubb thought that the New Zealanders had the spiffiest colour ever, black, so they decided that from then on Malmö Roddklubb's racing colours should be black and yellow (while the club's colours should still be white and blue). Added to the black and yellow was the griffin of the City of Malmö in yellow. HTBS’s Hélène writes in an e-mail: “Have you noticed that the Coastal World Championship in Istanbul (held in October) have had less coverage than the Championship in NZ? I wonder whether FISA is less interested in sea rowing? I agree with Hélène, FISA’s web site has not have that many feature articles about the Championships held in Istanbul. Click here to read what FISA wrote about the World Coastal Rowing Championships. Click here for the results. Well done, Hélène (and a thank you to Rowing Voice). She might not be the tallest, biggest, or even the strongest, but in the women's single scull final in the World Championships on Lake Karapiro, Frida Svensson of Sweden was the fastest and therefore the best! The photograph above, from Row2k.com, says it all. This means that the 29-year-old Frida, who rows for Falkenberg Rowing Club, broke the winning streak of Ekatarina Karsten, who has six world championships in the single under her belt. According to Swedish newspaper articles, the Swede's tactics for the race was simple: go out as hard as possible and try to stay in the lead. Or as we would say in Sweden: "det må bära eller brista" ["sink or swim", which in this case seems to be a mixed metaphor!]. Read FISA's article "Respectless Svensson shows no mercy" here. My warmest congratulation to Frida, her coach Johan Flodin, and the Swedish Rowing Federation! Today on FISA’s web site is an interview with famous coach Mike Spracklen, who at 74 is still going strong. 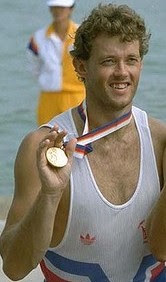 Spracklen once coached Sir Steve Redgrave and they are both from Marlow, a town just a few miles from Henley-on-Thames. Spracklen is at the World Championships as the coach for the Canadian men’s eight. 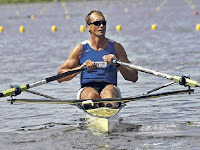 In 1992 and 2008, his Canadian eights became Olympic Champions. In these crews’ honour, Spracklen compose two poems, as not only has he great rowing coach skills, he also shines as a versifier. To read the FISA article, click here. Not only is FISA's web site offering results from the World Rowing Championships in New Zealand, the organisation is also presenting video clips on their 'World Rowing Video Channel'. To view the clips on the channel, please click here. It seems, according to one video clip from yesterday, that thousands of fans of the 'Cambridge Melbourne Cup Day' had gathered at Lake Karapiro to watch the rowing races and also the horse racing later in the day (probably on television, I guess). The video clip is showing a lot of ladies in fancy hats. This reminds me that at the first international rowing regatta in Sweden, held on 14 July 1868 in Helsingborg, the regatta ended with horse racing. Maybe this is not a bad combination, Boats and Horses! World Rowing Championships have started on Lake Karapiro in New Zealand. A little different way to follow the teams or certain athletes is to go to their web sites or blogs. When I was looking around for English-speaking rowing blogs, I could only find a few, actually the ones listed below. If you know of any others, please feel free to send them to me so I can posted them on HTBS. Thanks.